Tulips formed the theme of the engraved dials of many, if not most, English lantern clocks in the seventeenth century. This is hardly surprising in view of the 'tulip mania' which swept Britain from Holland in more than one wave at that time. It seems everyone was obsessed with the beauty of the tulip, if not with its precarious investment value. But on dials other than lantern clocks, engraved tulips as an all-over pattern were very uncommon. This much I knew, but not much more, when the recent discovery of a very unusual single-handed hooded clock, pictured here, caused me to look further into this subject, as best I could. It's a curious thing that collectors delight in the unusual and grow ecstatic about the rare, at which point they instantly turn to the reference books to 'research' their new treasure, to compare it with others in order to better assess its rarity, its eccentricity. And usually they find - pretty little. Such was the case when I tried to look up details of clocks such as this one. In fact this clock proved to be a one-off mechanically, so it is hardly surprising I could not find others to compare it with. But the most immediately striking feature of it to anyone is the most beautifully engraved dial, only seven inches square, with its exquisite little single hand, very much in the style of a lantern clock hand of the day. The dial is engraved all over the centre with flowers, predominantly tulips, instead of the more usual matted centre. 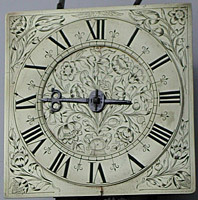 This was common on lantern clock dial centres of the mid to late 1600s but exceptionally uncommon on square dials of other kinds of clocks (namely longcase clocks, hooded clocks or bracket clocks). The same type of engraved decoration fills the corners of the dial, instead of the usual cast brass spandrels, which at this period normally featured a cherub head. Clocks which have this tulip-based engraving filling the dial centre and the dial corners are very few in number. It was obvious to me from the outset that this was a very early clock, exceptionally early, dating from perhaps the 1670s or 1680s. That much was evident from the dial style alone. I searched through all the reference books I thought might show clocks of this very early period in the hope of comparing those with this exceptional dial. In all I found about twenty examples, most being longcase clocks of short duration, but half a dozen were bracket clocks and three were square-dial lantern clocks. There was uncertainty whether some were small-dialled longcase clocks or hooded clocks or square-dialled lantern clocks, as, not surprisingly, few, if any, clocks of this exceptional age have their wooden parts surviving in unrestored condition. Some of these early cases have had substantial rebuilding, and some of the earliest clocks from before this period are themselves very much re-constructed around a few surviving pieces. One or two of them carried the actual date of making, something that is pretty unusual but an excellent help to dating by style. All were dated between 1664 and about 1680. All the textbooks which mention these types of dial comment on their great beauty and the skill of the engraver - how could they not, for they are amongst the finest dials ever made. One source suggests they were all the work of the same engraver, which possibility we will look at later. Many were similar to each other in nature, but I could find only two that carried identical designs. Most were variations on a definite theme. A few of them had their flowers springing from a central vase or urn, as this example does. Several aspects intrigued me and, as usual, the books were silent on those points which might have been of greatest interest. The authors simply did not know the answers to those questions, for which they can be forgiven, but at least they could have asked the questions. Why did a few clockmakers of this brief period of about fifteen years occasionally have this type of dial instead of the normal one with matted centre and spandrels? And almost all of these being makers whom we know to have made the normal types in greater abundance? Oddly enough the majority of these dials are on thirty-hour clocks, which have usually been regarded as the cheaper, poor relation of the eight-day. Some of the makers, who made clocks with this type of dial, are known to have been Nonconformists at a time when the drift to nonconformity was strong, many becoming Quakers. Jonathan Chambers of Shefford, Bedfordshire, was a Quaker. So was Daniel Quare of London. Ahasuerus Fromanteel of London was a Baptist, and so was his brother-in-law, Andrew Prime of London. John Hilderson of London is thought to have been Dutch and was probably a nonconformist Protestant. John Wise of London was a cousin of Joseph Knibb, and is known to have been a nonconformist at least in his later years. Edward East was a Catholic. Clocks with this type of dial are known by all of these makers. 1. The tulip-dial clock positioned in its hood of walnut veneer. Click for closer view. 2. The seven-inch dial engraved all over with flowers, predominantly tulips. Here the tulips spring from a central vase. The hand is of the same style as that of a lantern clock of the third quarter of the seventeenth century. Click for closer view. Other makers of clocks of this type are not known to have been Nonconformists, but that does not mean they were not, as our knowledge of such things is very scanty, especially at a time when many tried to conceal their nonconformity to avoid prosecution. These include Joseph, John and Peter Knibb of Oxford and London, Thomas Johnson of Southwark, London, Edward Stanton of London, Richard Greenhill of Ashford in Kent, Thomas Power of Wellingborough, Northamptonshire. The point about nonconformity was that some of the stricter believers regarded it as a sin to make statues or graven images. Man was made in God's image and to make representations of the human face was to represent God, and was forbidden. And so some may have avoided cherub-head spandrels and used flowers instead, which could offend no-one. But Nonconformists may well have included conformists amongst their customers and may have had to settle for making what the customer wanted rather than what their own personal inclinations suggested. And vice versa. One suggestion that engraved dials of this type were cheaper than the matted centre version cannot be correct, as it must surely have demanded far more skill and time to engrave such a dial than to matt it and attach spandrels. And yet many of these tulip-engraved dials are short-duration clocks, which we know were usually cheaper than longer duration ones. Could it have been that these lavishly-engraved dials were done to demonstrate by their very splendour that short-duration clocks were NOT the poor relation? 3. Movement of the tulip-dial clock seen from the left showing the unique layout with three tall plates, the shouldered pillar system and the cranked striking levers. Click for closer view. 4. Movement of the tulip-dial clock seen from the right. Some of the arbors are tapered and without collets, like a lantern clock. Click for closer view. We have no way of knowing who engraved these dials, although there may be a clue on the back of the chapter ring of this clock, where there is an engraver's 'doodle'. It looks like the profile of a bell as a comic face with two eyes and the clapper as a nose. This was the sort of practice work an engraver sometimes did to test the sharpness of his tool before or during engraving. It might be a meaningless doodle or it might be a play on words, a sort of trademark or symbol - if for instance the engraver's name was Bell, or if he worked 'at the sign of the Bell'. Such marks are known by brassfounders, whose marks are impressed during the casting process. Only recently I noticed a brassfounder's casting mark on the back of a mid seventeenth-century lantern clock chapter ring by Thomas Loomes of Lothbury, London, which took the form of the profile of a bell with the clapper protruding, a casting mark which was previously unrecorded. Even more recently an American colleague reported to me a lantern clock by Henry Ireland, the well-known Lothbury maker, who was a contemporary and associate of Thomas Loomes, working only a few doors away in the same street - and this clock was signed at a previously unrecorded 'address': 'Henry Ireland at ye Bell in Lothbury'. These founders' marks are cast into the metal; the mark on this clock is engraved onto it. Henry Ireland was born about 1618, was apprenticed in 1632 to William Selwood of the Mermaid in Lothbury, who left him a bequest on his death in 1653, and was last heard of in 1671, when he was about fifty three years old. Thomas Loomes also worked under the Selwoods at the Mermaid. Is this pure chance? Each bell mark on the back of the chapter ring of the clock? Who knows? Thomas Loomes died in the Great Plague of 1665. We must bear in mind that Lothbury was destroyed in the Great Fire of 1666, so although Henry Ireland survived the plague and the fire, it is possible he kept using his bell 'trademark' - or whoever was the 'master of the bell'. Alan Lloyd thought all these tulip dials were the work of one man. I can't see that, as all the ones I have seen, mainly through illustrations in books of course, do not seem to me to be by the same hand. John Droeshout's name was an abomination to the English scribes of the day, and was sometimes written Drowset and Drussett, even Drossade, Drossart and Drossat(t)(e). We English had enough trouble spelling our own names in those days, but to be expected spell the names of foreigners with odd pronunciation was beyond reason. John Droeshout was made a free Brother in the clockmakers' Company in 1632. Could he still have been working in the 1670s, and into the 1680s, fifty years later? We know these tulip dials dated between 1664 and the 1680s. It does sound like a Dutch name, and the Dutch were famous engravers, so much so and so much ahead of the English, that English mapmakers in the early seventeenth century sent their printing plates to be engraved in Amsterdam , or sometimes brought Dutchmen to London to do the work here. There were many clockworkers in London at that time from the Low Countries, notably from Amsterdam and from Flanders, where Ahasuerus Fromanteel's own family originated. Just how many of them were engravers we do not know. We know some of the names of some who were engravers, but we don't recognise the work of any one individual, as engravers did not sign their work - at least not one has yet been recorded who did at this period. Then there is the whole output of London lantern clocks throughout the whole of the seventeenth century, a great many of which have tulips engraved as a dial centre theme. Did he who engraved the tulip dials under discussion, also engrave what must have been thousands of lantern clock dials, and if so, then they could not possibly have been the work of one man. The movement of the clock is of short (thirty-hour) duration like several others with this extraordinary type of tulip dial. It is wound by an endless chain with a single weight, on the Huygens principle, though might originally have had two separate weights. But mechanically it appears to be unique. Certainly it is like no clock I ever saw before, nor any I can find in any book, and all those authorities I consulted personally agreed they had never seen anything like this before. The two trains are set back-to-back, as in a lantern clock or posted movement clock, the striking train behind the going, the strike controlled by an outside countwheel, as virtually all thirty-hour clocks of all types were. However the movement has plates, not crossbars, yet it has three plates in row (as opposed to the two plates in a normal plated clock) just as a posted clock would have three crossbars in a row. It further has a top-plate, again like a lantern clock, but an overwidth one which overlaps all round. There are four pillars, each one with a little decorative turning, but not flanged or finned like typical London pillars of this period. Each pillar has a shoulder to take each of the three plates, which are pinned tight up against each shoulder. The pillars are further pinned outside the two outer plates. Edward East pinned his pillars at the backplate and riveted them at the front. Fromanteel usually did the opposite. Latching achieved the same result as pinning and was in essence the same thing (i.e. detachable), but looks prettier and is more readily dismantled. Pinning (or latching) at both ends of the pillar tends to be a feature of earlier clocks, whereas riveting at one end (usually the backplate) and pinning at the other soon became the norm. In the earlier years clockmakers swapped and changed the end which was riveted. All we can deduce from this is that when the unknown maker of this clock pinned his pillars at both the back and the front, he was following the earliest practice known in making pendulum clocks, which were first made in 1658 - though whether he knew that we cannot say. This does not necessarily mean it was made at the very earliest date, for, until 1670, the making of pendulum clocks is said to have been limited to the work of the Fromanteel family and their immediate associates, which included Edward East, John Hilderson and Samuel Knibb. 5. This rear view of the clock shows the plate with protruding 'legs' at the base and similar 'arms' at the top. The hammer crank system and its stop spring can be seen on the top plate. Click for closer view. 6. 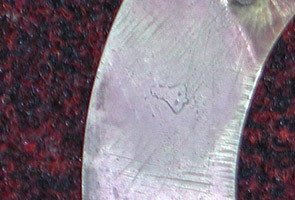 Detail of the engraver's practice work, apparently a profile of a bell with two dots for eyes and the bell clapper for a nose. Click for closer view. The strange construction used for this movement is a sort of hybrid between the plated and posted types of movement. Plated movements tend to be thought of as sturdier in being less likely to flex. Posted movements were generally a little easier (i.e. quicker) to dismantle but not to assemble. 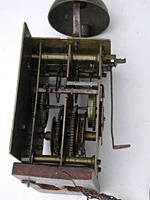 By combining features of both this unknown and innovative clockmaker may have been striving to derive the best features of both types of movement - trains which could be dismantled independently of each other rather like some posted clocks but with plate fixing which offered easier re-assembly. Certainly his unusual shaped plates are unlike those on any other clock, and no other clock is recorded which has a movement built in this hybrid style. The lower part of the plates end in extensions, on which the clock 'stands' and which might almost be called feet, or legs. So far as I can establish the clocks of the earliest makers did not have this feature, with the exception of one by Jonathan Chambers of Shefford, dated to about 1665-70 and said to be one of the earliest thirty-hour clocks in existence. This was a practice which was 're-invented' quite independently by several widely-separated makers after about 1710, after which it was used by makers here and there until the third quarter of the eighteenth century. As well as these odd 'legs', this clock has the tops of the plates shaped in the same way, so that it might be said to have 'arms' as well as 'legs'. This clock appears to have been built originally with a verge escapement, but surprisingly the verge wheel, or crown wheel, seems to have been positioned underneath the top plate, instead of above it, which was usual. It was converted to anchor escapement long ago at an indeterminable period, and now has a long pendulum of about one and a quarter seconds beat. It may be relevant that the earliest anchor escapements are said to have all had one and a quarter second pendulums. The hammer is positioned on the left of the clock and strikes the bell from the inside, as in a pendulum lantern clock. But the leverwork to drive the hammer goes through two crank joints to eventually reach the hammer, which is mounted on an arbor on the top plate with a large spring serving as a hammer stop lying laterally across the top plate. Why the maker went to these extraordinary lengths rather than the more usual and simpler method, I am not certain. But it might be for the same reason that we can deduce for others of his methods, in that it would simplify dismantling one section of the clock without dismantling the rest, making servicing more convenient. At the front end of the hammer arbor the pivot hole is stopped by a swivelling piece of brass, which when down holds the arbor in its required position, but when lifted will allow the arbor to slide forward so as to be removed complete with hammer - another example of the easy-to-dismantle principle which seems to have been used throughout this clock. The top plate is also pinned into place, unlike those of other clocks. Again I can only suppose that this is so that the whole top plate with bell and hammerwork can be removed, if desired, without dismantling the wheelwork. The way in which the maker has pinned each plate to its shoulder means that it would be possible to dismantle either the striking or going train independently of the other, something not possible with a normal posted or lantern clock movement. The lifting arbor for the strikework originally ran fully between the two outer plates but was altered later to pivot within its own train space at the back. This again may have been to facilitate dismantling of the strike train independently of the going one. It is interesting that some of the very earliest prototype pendulum clocks by such makers as Ahasuerus Fromanteel, his son John Fromanteel and Samuel Knibb had split front plates in such a way that one train could be dismantled for repair without dismantling the other(s). I think it is true to say that it was only a very few clocks by the earliest and finest makers which had this feature, which had virtually ceased by 1670. This was a practice usually reserved for side-by-side trains in bracket clocks and three-train longcases, all of which were much more costly than a thirty-hour clock. This tulip-dial clock shows how what may have been a country maker could achieve the same result of easy servicing but in a much simpler and less costly way. It is altogether an ingenious system. This particular clock must have been a hooded clock as a seven-inch dial is too small to have been a longcase even at this early period. It is housed in a hood made of pine and veneered in walnut, and although this hood appears to date from a similar period, its fit is less than perfect, which means we cannot be sure if it is the original hood. The clock was discovered in unusual circumstances described below. 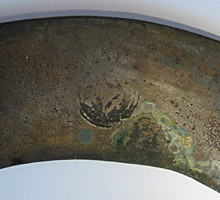 When the clock was discovered, the wall bracket section of the hood was missing, but the upper section survives. That any part of the clock survives at all is miraculous. It was rescued from a waste skip along with two other interesting old clocks, a hook-and-spike clock and a lantern clock both dating from the middle eighteenth century. The lantern clock was part dismantled, its dial having been removed and the star-wheel re-attached to the hand (but left separate from the dial), presumably so that neither part could become misplaced. But the iron hand had been fixed in this way long enough for its iron pin to have rusted solid, with the result that it had to be sawn off. This means that that clock had been in a part-dismantled state for a good many years - twenty, thirty, fifty? Detail of the bell casting mark behind the chapter ring of a lantern clock by Thomas Loomes. Click for closer view. 8. The three clocks as removed from the skip. Click for closer view. A clock would only be part-dismantled and part-reassembled again in this manner by a restorer or serious collector, who had presumably put the clock aside to work on later (as we all do) - but in this case he never got back to it. The fact that three interesting clocks came from this same source implies it was a collector who knew enough to collect items of serious antiquity. 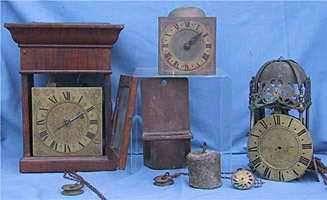 For these once-treasured items to end up in a skip must imply that the owner died, the clocks were left to rust in some damp place such as a cellar or outbuilding, ultimately to be thrown out by a disinterested inheritor having a clear-out, or by builders, who came across them during a house restoration project. Someone unknown had the sense to rescue them from the skip and send them to auction, where their merit was recognised. At least now the years of neglect are over and the clocks will be appreciated for what they are. This clock is an exceptionally rare early hooded clock of the 1670s or 1680s with a movement of uniquely-different construction, and a strike layout which is to say the least eccentric, presumably devised by some rural clocksmith of immense ingenuity who worked in provincial England near enough to London to obtain a dial there of the latest fashion and the finest quality. Joseph Knibb obtained such dials from London when still working in Oxford and before he himself moved to London in about 1671, which shows this is far from an unlikely possibility. The plainness and heavy construction of the movement may suggest that it was not made in London, where the Edward Easts and Joseph Knibbs of this world used similar dials but produced mechanical work of a far more refined and artistically fancy nature. I cannot help wondering whether the owner who set these clocks aside perhaps half a century ago, knew just what a rarity he had in this tulip-dial clock. I think it is unlikely. He obviously loved his clocks and loved this one, but our knowledge of such clocks has come a long way in the last fifty years, and whilst I am sure he knew it was unusual, I doubt he would have recognised its uniqueness. But the most hair-raising aspect of all this is to think that this extraordinary tulip-dial clock, unique amongst clocks of even this early experimental period, was almost lost to us for ever.